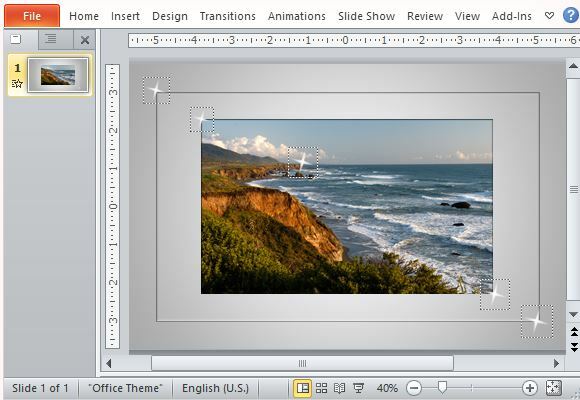 This template contains a subtle animation that does not take away from what you want to highlight, which is the photo itself. It uses sparkles that animate so the effect makes the slide look like a shining, glossy frame to a work of art, which is the image in the center. 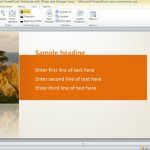 This template for PowerPoint 2013, with backward compatibility with earlier versions, can be used for many types of PowerPoint presentations. You can use it if you want to display your own photography, like in a portfolio. 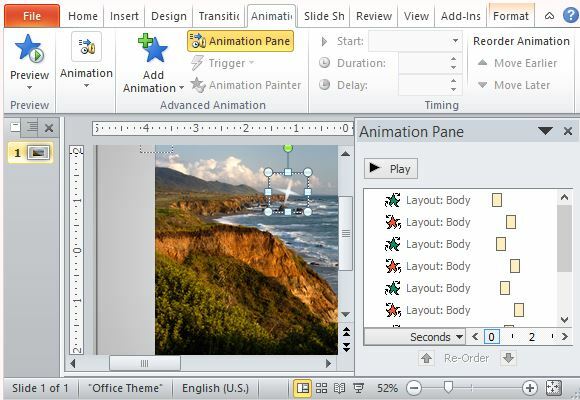 This enhances the effect if you want to include pictures of landscapes or scenery in your presentation. This makes it perfect for tourism, family or personal photo albums, weddings, branding, product concepts, vacation spots, architecture, design or even artwork presentations. This template with sparkling effect can also be used for geography, history, geology, biology, botany, marketing, culinary, interior design, gardening, and so many other presentation topics. The slide template is designed to easily blend in with any design or theme, with its light gray background. 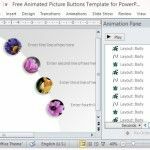 You can easily follow the directions that come with the template to insert it in your own presentation, or to change the photo to your own. 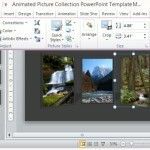 Simply select the sample picture and delete it. 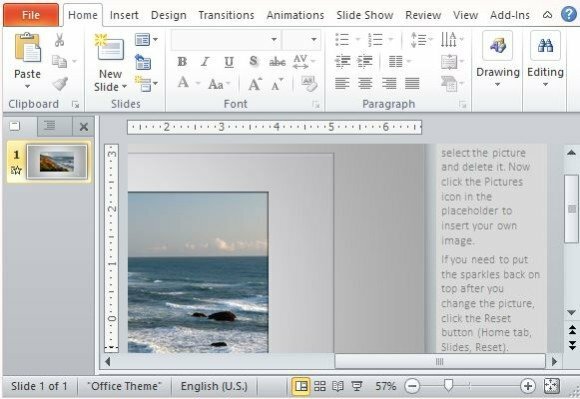 You will see a Picture Icon that you click to insert your own photo from your computer. You can arrange the sparkles on top of your photo by clicking the Reset button located at the Slides option under the Home tab in the Ribbon. 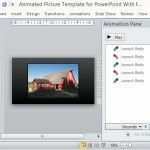 To use this more than once on your presentation, for photo albums, simply duplicate the slide and change the photos as you go.